I've been really enjoying listening to podcasts lately and have discovered several that I'm finding really interested and thought provoking. One of these being the Food Psych podcast by Christy Harrison. The Food Psych podcast has really challenged my thinking around food and encouraged me to reflect on my own thoughts and feelings. 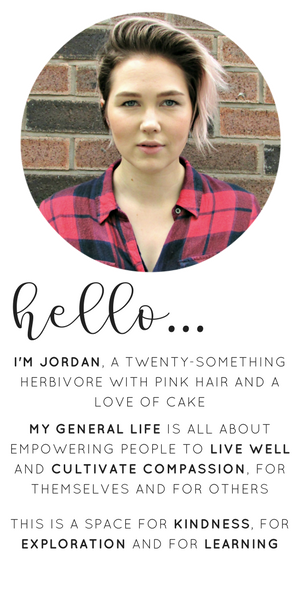 Her podcasts look at making peace with food. With our relationship to food, with accepting ourselves regardless of what our body shape is. It also discusses challenging societal norms around food, body image and size and weight bias. It's got me thinking a lot about my relationship with food and my body and how I might like to change this for the better. Feeling guilty about the food we put in our mouths is something I'm sure we've all done on more than one occasion. "Oh, I really shouldn't have eaten that cake, it's so unhealthy." I know I've done this countless times and then proceeded to worry about any hard work I've put in to get my body looking "perfect" being null and void. I've also then promised myself that I won't do it again, a promise I've never been able to keep. Because that kind of restriction just doesn't work for me. And why shouldn't I be able to have my cake and eat it? I've really been reflecting on our society's idea of good and bad foods. Good foods being fruits and vegetables and healthy things and bad foods being processed and laden with sugar and fat. Actually, food is food. Regardless of where it comes from or what goes into it, it's just food. And some food's are more nutritionally dense than others. It doesn't mean that they're bad or even evil. And it doesn't mean that you're bad if you sometimes choose to eat foods that are maybe less nutritionally dense. More recently I've been trying to listen to my body more and identify what it needs and wants in terms of food, along with why it might need it. I was brought up having what I feel are typical meals e.g. cereal for breakfast, sandwich/soup for lunch and a large evening meal, typically with something sweet afterwards. My eating is habitual. Something that I've started trying to challenge in order to give myself more freedom to listen to my body. It's hugely psychological and for me is about learning to take notice. What have I learnt? That I don't always need food the way I thought I did. I might want it, but now I'm starting to question why I want it. Do I feel like I need that chocolate bar because I've had a really busy day at work and I'm feeling a bit stressed? Probably. So what can I do to manage that emotional need, because eating chocolate isn't going to fix the cause of the stress or tiredness or whatever else is making me feel that way. I think the media has a huge role to play in fueling people's views on food and body size. What with all that fat shaming, thin shaming, diet criticisms and just general negativity. It almost feels as though you can't do right for doing wrong. And honestly I'm just so over that. Why are we letting the other people paint us a picture of how we should look or act or even what we should eat? It's not their picture to paint. It's our picture, because your body is precisely that, your body, and you should love it regardless of what shape or size it is and you should choose how you want to fuel it. However you believe we came to be on this Earth, your body is a miracle. Embrace it, love it, nourish it and enjoy it. Because really it doesn't matter what size or shape it is, we're all different and that's what's so wonderful. 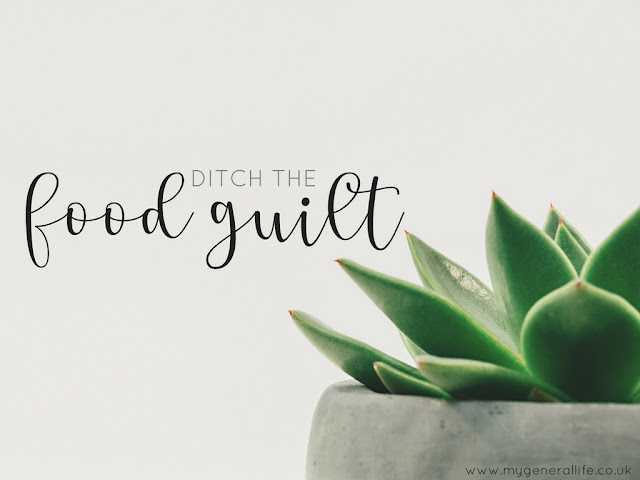 As the aim of this post was to talk about food and food guilt, I think it's important to highlight the act of making choices that are healthful or health promoting. And I don't just mean that in the sense of choosing healthy foods. Healthful choices also refer your mindset and the psychological impact that these choices can have. This could incorporate not depriving yourself for the sake of appearance, not feeling guilty for the type of foods you eat or don't eat or not engaging in harmful eating habits - although I'm fully aware that this is a very sensitive issue and not something that can be worked through overnight. At the end of the day, food is there to be a fuel for your internal fire. The fire that keeps your going day after day and week after week. Learn to listen to your body and it will tell you what it needs to keep going, what it needs to carry out the millions of actions going on inside of you right now. Given that I have just harped on about the need to remove restrictions and food stereotypes, I feel I should probably touch on my choice to impose massive perceived restrictions on my diet by living a vegan lifestyle. Those restrictions are exactly that. Perceived. Because honestly I've never felt more free in my diet than I do now. I don't feel restricted because my choice to eat a vegan diet is not fuelled by food guilt or a wish to eat healthier. It's fuelled by my ethics and morals. I think it's hard to fully see unless you're living it, I know before I went vegan my thoughts were around how much it would restrict and impact on my lifestyle. But when I think about my diet now I don't see restrictions, I see possibilities. I think it's so important if you're considering making a drastic change to your diet that you consider why you want to make this change. Are you doing it because you think it's a healthy choice? Are you doing it because you think or know your body will feel better for it? It's so important to be sure of your choice and that you're doing it for the right reasons, for you. Since making a choice to listen to my body, my diet it the most nutritionally rich diet I've ever eaten - although don't worry though, there's still cake and chocolate in there form time to time too. It's not always a walk in the park, I'm still learning and I'm not claiming to be any sort of expert, in fact I'm far from it. But I'm giving it a try and it's honestly been liberating. 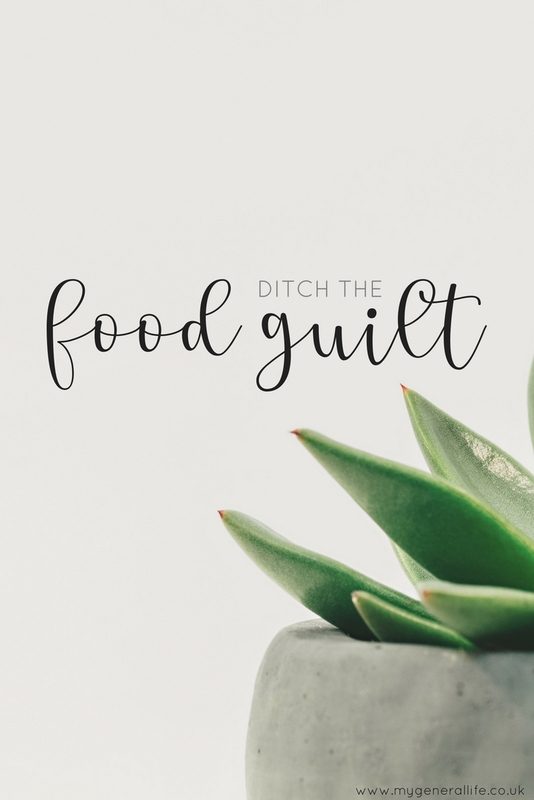 If you've managed to make it to the end of this epic blog post and the topic of ditching food guilt interests you then why not share it - click the link below to tweet about it! Wonderful post. I've written about food guilt previously and I'm not sure I've summed it up as eloquently as this - there seems to be a 'coming of age' for clean eating, and the realisation that it's not a 100% sustainable lifestyle due to the psychological pressures that gorgeous IG feeds and blogs seem to create in all of us. I wanted to add, if you (or any of your readers) feel like this is becoming more of a problem they can cope with, see a doctor, confide in someone, but don't let it go unspoken. Orthorexia (becoming obsessed with clean eating to the point of it being unhealthy) is, to my mind, a real illness and needs to be recognised for anyone facing it. Fab post! I talk about this a lot as I write recipes for kids and family. It's just about balance. Healthy living is about healthy relationships with food not banishing one type of food (allergies aside!) A really good read thanks.